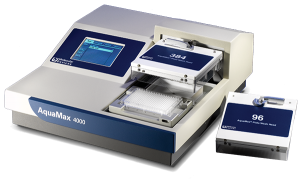 The AquaMax® Microplate Washer can be programmed with just the right plate or cell washing protocol for a thorough, gentle wash that wastes no time. The Cell wash heads for 96- and 384-well formats have angled dispensing pins for extremely gentle washing of weakly adherent cell types. For biochemical assays, the washers are primarily used to remove unbound material and unreacted reagents in microplate wells and are compatible with SBS-conforming polystyrene and polypropylene flat, round and V-bottomed microplates. The AquaMax® Microplate Washer can be seamlessly integrated with a StakMaxMicroplate Handling Stacker for batches up to 50 plates. 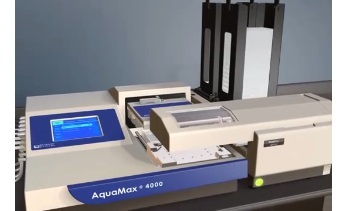 AquaMax washers are compatible with all major microplate automation systems. Using the intuitive touchscreen user interface, up to 100 different programs, each containing up to 50 program steps, can be configured to wash plates and perform system maintenance. Various system head designs and control features optimize the ability to run biochemical and cell-based microplate washing applications. Fast sequential washing, continuous washing and bottom washing options allow the AquaMax Washer to be set up to meet specific assay needs while reducing washing time to a minimum. AquaMax Washers can also be used in conjunction with magnetic adapter plates to wash the the magnetic beads used in highly multiplexed assays.